Liverpool Sound City’s final day closed spectacularly, with Belle & Sebastian and Charlatans’ frontman Tim Burgess playing the main stages. Though it was the final set of acts to grace the stage belonging to rock and roll hallowed ground, The Cavern, that truly rocked the closing night. This year Liverpool Sound City moved to the docks, losing its unusual charm of hosting groups at locations all over the city, and gaining a true festival vibe. The famous Cavern Club sponsored their own stage, and filled it with some of the best rock acts you could hope for. Korea Rocks has visited the UK, and the Sound City festival for three years now, and this year it was bigger and better than could have been anticipated. Five impressive Korean indie groups took to the stage, each with their own USPs and entranced the Cavern crowd. 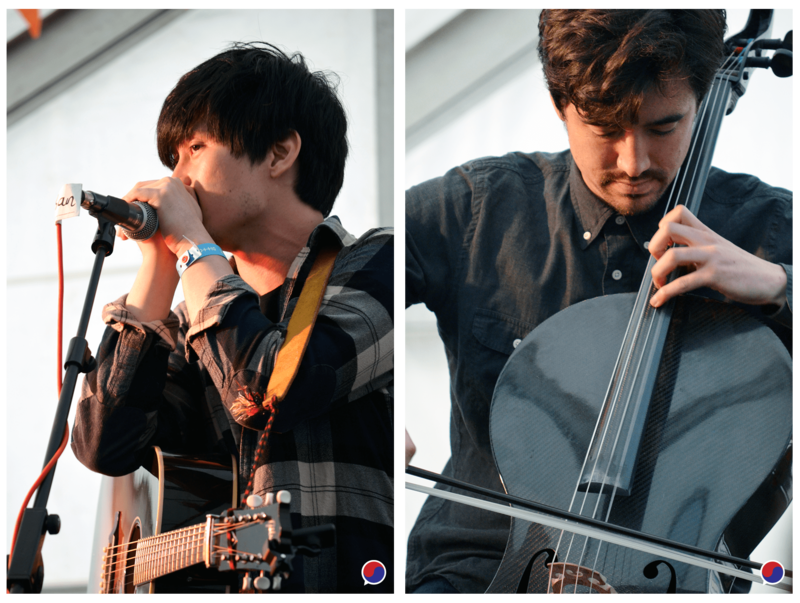 Indie folk trio MonoBan kicked off Korea Rocks. Formed of singer and guitarist DAY1 (Jang Dayone), classically trained cellist George Durham, and metal drummer Jifan Ly on percussion that includes the percussive box known as a cajón. As a long time fan of Finland’s Apocalyptica [a metal group formed of three classical cellists, and a drummer] George Durham is someone I have encountered before, his YouTube features hypnotic covers of many tracks I associate with the Finnish group when played on the cello. MonoBan certainly showed Sound Citizens that Korea has more to offer than its shiny pop scene, and it is more than worth their time and ears. Many listeners stayed, or returned after the short interval to continue listening to the Korea Rocks set, a definite feat considering The Cribs had just hit the Atlantic Stage and had an impressive one hour set lined up. As The Cribs kept many entertained Dead Buttons hit the festival for the second year. Garage rock duo, guitarist Hong Jihyun and drummer Lee Kanghee, had the stage explode with their sound. Their performance at this years festival was bigger and better than their previous, Dead Buttons have certainly grown and improved over the past year. Filling their set with high energy rock gems such as Witch, Dead Buttons hooked their crowd in unlike anyone else I’d seen at the festival. Dead Buttons are accessible to all, taking a more international approach to the rock scene, and singing in English. It is maybe this more international styling that has audiences so hooked by them, they are a shining example of what the Korean Indie scene has to offer. Korean punk was next to take over the Cavern Stage as PATiENTS gave Sound Citizens a second taste of their hybrid punk, and their new album 18. Not only did the trio of punk rockers, Sumin Jo (bass and vocal), Hyukjang Kwon (keyboard and chorus) and Jaehyuk Lee (drum and chorus), capture their audience with their unique style, that impact remained, people even shouting ‘LET’S GO!’, the hook from a track the whole audience had been able to chant along to, to the trio as they left the festival hours later. Vocalist Sumin Jo was far more comfortable with a none-native audience than he had been last year, even joking that everyone must buy their album or they’d be charged over-weight luggage fees on the way back to Korea. Of course, they had no problem with that, every copy selling before the end of their set. 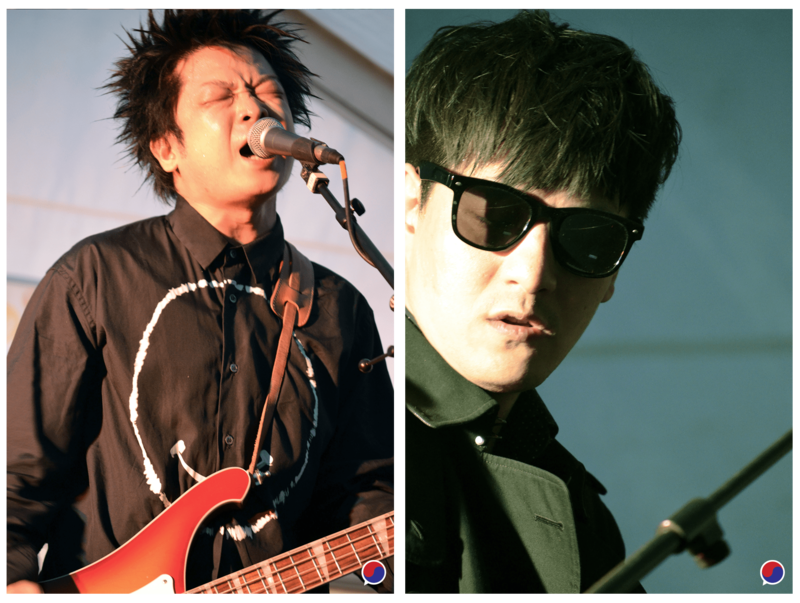 Psychedelic blues rock trio Third Stone, a reference to Earth being the third stone from the Sun, are formed of vocalist and guitarist Park Sang-do, bass player Hahn Doo-soo, and drummer Ahn Seung-yong. Third Stone may have questionable fashion styling, they all wear the same trousers and variations of the same 60s-psychedelic shirts, though it certainly fits their sound. There’s something ethereal about Third Stone, their music easily able to transport you to another place. I am not old enough to have experienced the music that inspires the trio, though thanks to my mother’s taste in music the likes of Hendrix, The Doors, and Pink Floyd were all artists I was fortunate enough to hear as I grew up. Just as each of these artists had the ability to create their own wonderfully vivid worlds for me with their music, Third Stone too has that charm. Jambinai closed the Cavern Stage at Sound City, and boy did they prove Korea Rocks. Jambinai are unlike anything you’ll have ever seen, even if like me you appreciate the more unusual acts in rock and metal. Jambinai are a metal group, though their Korean origin is unquestionable, as each is a scholar of traditional Korean music. Guitar and piri (a traditional style oboe) player Lee Ilwoo is joined by Kim Bomi on haegum (somewhat like a fiddle) and Shim Eun Yong on geomungo (akin to the German zither) – for live performances they’re often accompanied by a bass player and drummer too. It is hard to capture the impact Jambinai have on you as they play, they are so unique and so powerful it is hard to contain your awe. Though I’d recommend seeing all of the acts that played Korea Rocks, Jambinai are the ones you should never pass up the opportunity to see. The Korean indie scene is vast and colourful, and full of hidden gems that are worth paying attention to! Why not start with these five, and learn why Korea Rocks.